Acanthocleithron is a monotypic genus of catfishes in the family Mochokidae (Teleostei: Siluriformes), better known for members of the genus Synodontis. Acanthocleithron chapini, the only described species, is known from only a handful of specimens in museum fish collections. As such, the known geographic distribution of the genus is rather limited when compared to others in the family. Thus far, Acanthocleithron is known from the upper Congo near Avakubi on the Ituri River and localities far down river near Malebo (Stanley) Pool. Acanthocleithron chapini is a small species, reaching no more than 10 cm in total length. In terms of general morphology, it is most similar to the species in another small genus, Mochokus. The body form is best described as terete or cylindrical, as opposed to the deep-bodied form seen in some species of Synodontis. As with many mochokids, Acanthocleithron is characterized by the presence of branched mandibular barbels, a strong nuchal shield, and mandibular teeth in a cup formed by the dentary. The mandibular teeth are not s-shaped however, as in most other mochokids. As the genus name indicates, Acanthocleithron is diagnosed by, among other things, spines on the cleithrum. Closer observation has revealed that this character may be sexually dimorphic (or polymorphic). Sexual dimorphism in spiny ornamentation and in the size and shape of fins is fairly common in the Mochokidae (Roberts, 1989; Seegers, 1996; Friel & Vigliotta, 2006). It is fair to say that nothing is known about the ecology of Acanthocleithron. Extrapolating from the diet of other mochokids, it would be safe to assume that this species is omnivorous. This specimen, a paratype, was collected from the Ituri River, Avakubi, Congo by H. Lang. 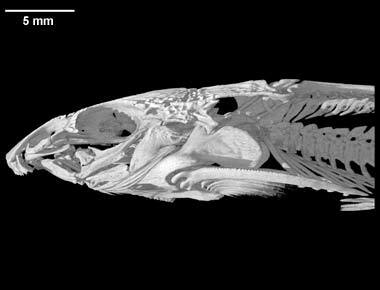 It was made available to the University of Texas High-Resolution X-ray CT Facility for scanning by Dr. John Friel and Mr. Thomas Vigliotta of the Cornell University Museum of Vertebrates. Funding for scanning was provided by the All Catfish Species Inventory project (NSF DEB-0315963), and funding for scanning and image processing was provided by a National Science Foundation Digital Libraries Initiative grant to Dr. Timothy Rowe of The University of Texas at Austin. The specimen was scanned by Matthew Colbert on 21 September 2006 along the coronal axis for a total of 1695 slices. Each 1024x1024 pixel slice is 0.03573 mm thick, with an interslice spacing of 0.03573 mm and a field of reconstruction of 16.8 mm. The first 769 slices were used for the head animations. Friel, J. P. and T. R. Vigliotta. 2006. Synodontis acanthoperca, a new species from the Ogôoué River system, Gabon with comments on spiny ornamentation and sexual dimorphism in mochokid catfishes (Siluriformes: Mochokidae). Zootaxa 1125:45-56. Roberts, T. R. 1989. Systematic revision and description of new species of suckermouth catfishes (Chiloglanis, Mochokidae) from Cameroun. Proceedings of the California Academy of Sciences 46:151-178. Seegers, L. 1996. The fishes of the Lake Rukwa drainage. Annales de Musée Royale de l'Afrique Centrale (Ser.8), Sciences Zoologiques 278:1-407. To cite this page: Mr. Thomas Vigliotta, 2007, "Acanthocleithron chapini" (On-line), Digital Morphology. Accessed April 25, 2019 at http://digimorph.org/specimens/Acanthocleithron_chapini/head/.